Let it be a vacation or business trip or a family function, or you just want to hang out with your friends for quick bites or let it be a date with your loved one, this place indeed has everything you ever want; and that also everything at one place like a jackpot and thus being one of the best hotel in Ahmedabad. With amazing infrastructure this place highlight the fine craftsmanship and attention to detail that distinguishes the hotel.Each room is elegantly designed with care to please each and every guest who visit hotel Flora. 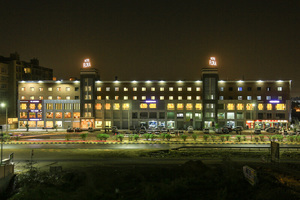 It is a five story building including a food court, a restaurant and a banquet or conference halls in Ahmedabad. Whether you're looking for a quick bite with friends, somewhere to stop during a hard day of shopping or dinner for the whole family, their rustic dishes with a tongue twist are perfect for you. They have successfully maintained utmost consistency in their hospitality as well as food quality & taste.